(Left to right) Scott Borg, Adam Levin and Matthew Rhode perform as the group ‘The Great Necks Guitar Trio’ during the last night of the guitar festival. Photo by Anna Meassick. 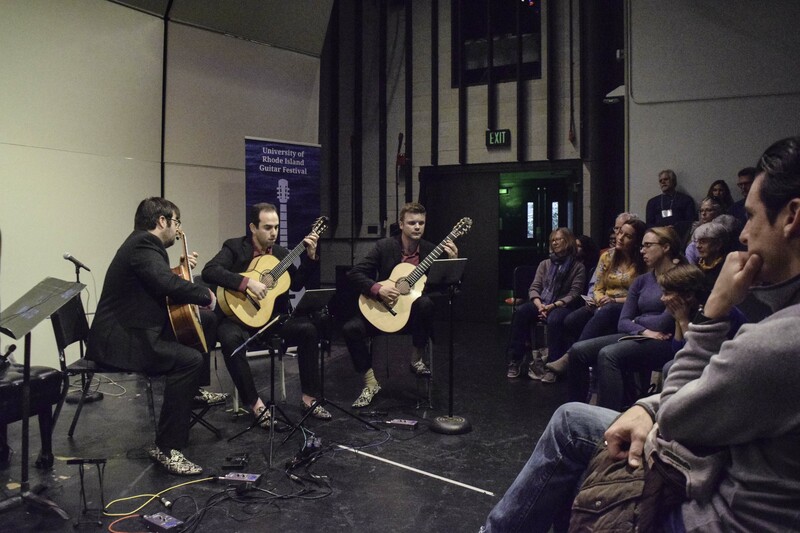 The University of Rhode Island, in collaboration with Pump House Music Works, hosted its fourth annual Guitar Festival this year featuring many international renowned musicians from April 7 to April 9. The festival hosted various local and internationally renowned musicians and guitar players from all around the world such as Gaelle Solal from France, Scott Borg from Australia, An Tran from Vietnam, Maarten Stragier from Belgium and many more. 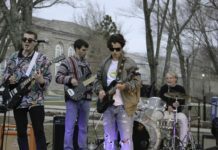 The two venues artists performed at the University’s Fine Arts Center and the Pump House Music Works, located in South Kingstown. 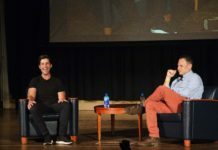 One of the unique features about this festival is that on top of guitar concerts and recitals on all three days, it also had masterclasses and ensemble coaching sessions that were open to the entire Rhode Island community. These coaching sessions were personally provided by the renowned artists over the weekend. 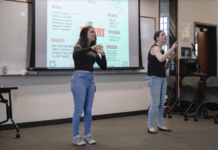 Building off of last year’s success, the festival also hosted their second annual Virtual Rising Star Program. This is a program that allows young guitarists the opportunity to compete in a low-stress competition with their peers worldwide. In order to compete, participants submitted a 10 minute video before the festival started. The festival ended with the Gala performance, at 6 p.m. last sunday, at URI’s concert Hall. Clarice Assad, a famous Brazilian American composer and jazz vocalist and pianist, played alongside the “Great Necks Guitar Trio.” This repertoire included adventurous and orchestral works that was originally meant for an orchestra, on three guitars. A new “wacky” version of famous compositions and musical pieces were the highlight of the show. Levin emphasized that this festival is open for anyone at any level of music. He believes that the guitar is the most popular and beloved instrument in the world and also made this festival into a great opportunity to meet other like minded folks and hear great music. Many international guitarists presented programs extremely different from one another. Some played Bach and Villa-Lobos and others playing jazz, tango, flamenco.